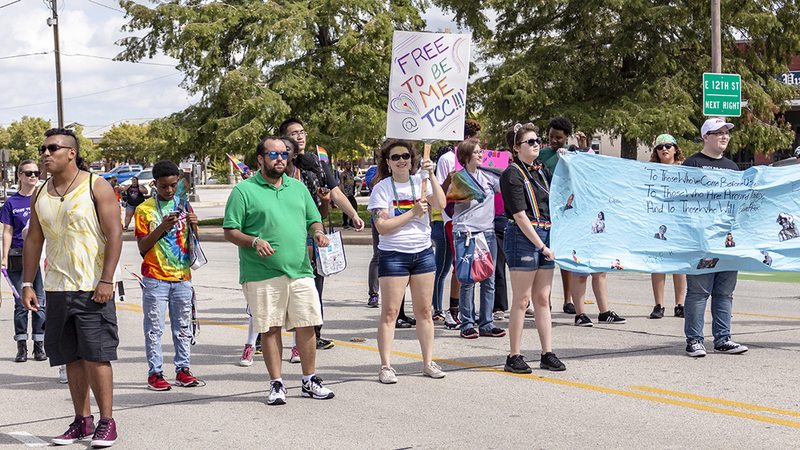 “Free to be me at TCC,” was the chant that rang out through the streets of downtown Fort Worth as a number of students, faculty and staff from across the district marched during this year’s Tarrant County Pride Parade. TR student Alli Williams attended the parade with her girlfriend, NE student Bailey Arnold, and Williams’ mother. “It was great to see TCC involved in the parade and how the college has recognized the community on campuses too,” Alli Williams said. 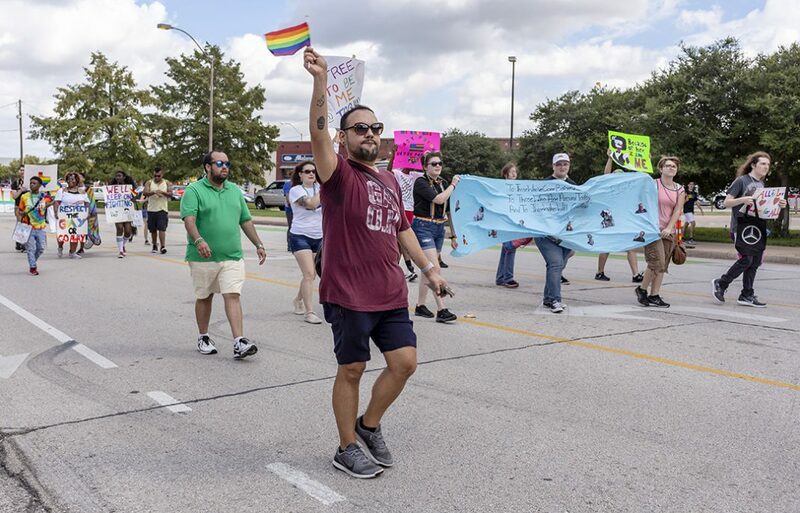 It was Williams’ third time at Tarrant County’s parade, and both she and Arnold marched in Dallas’ pride parade back in September. 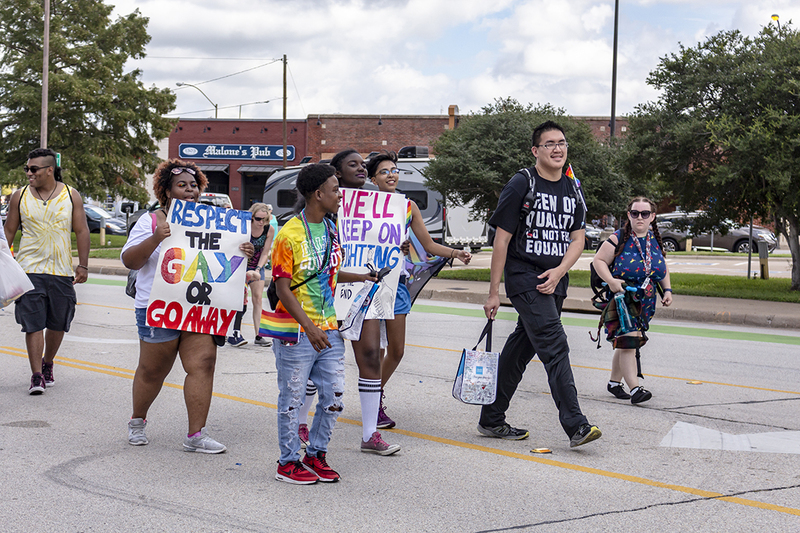 But for a number of other students, like NE student Owen Landregan and South student Miracle Stokes, it was their first ever pride parade. Stokes is the president of South’s Spectrum club, an advocacy group for sexual orientation and gender identity. She said she enjoyed her first pride parade and had a lot of fun with everybody from TCC. 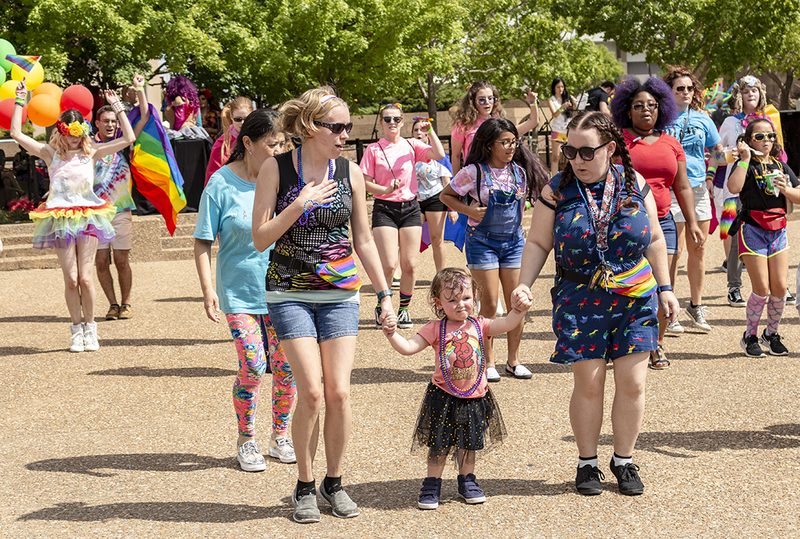 “I love the fact that all these people are here just to have fun and communicate with each other and come together as one and tell people that we’re here and we’re queer,” Stokes said. As for spreading the word about TCC’s acceptance, Stokes said she was proud she got to do just that. “I love that my community allows us to just do what we do, and you really do feel free to be yourself at TCC,” she said. 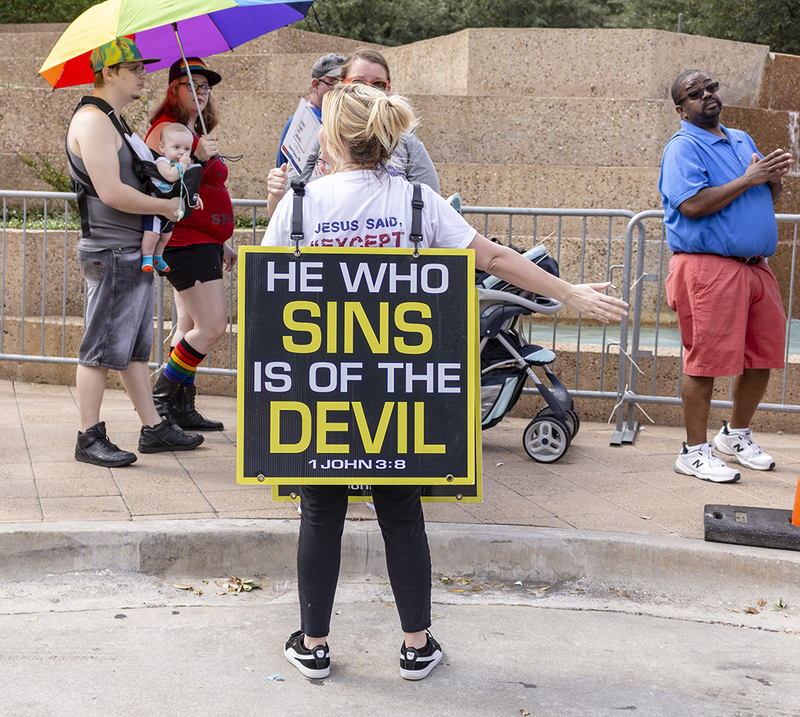 The message was felt among the crowd particularly toward the end of the parade when a handful of protesters were scattered throughout the crowd shouting Bible Scriptures through their megaphones and condemning those celebrating the LGBTQ community to hell. Also protesting the parade was a woman named Kristi, who also chose not to give her last name. She said she was there to encourage the parents of the children in attendance to do right by them. Stokes said she didn’t care about the protesters. “I was just waving the poster in their face, and as they got louder, I just started smiling more, so it’s really nothing to me,” she said. 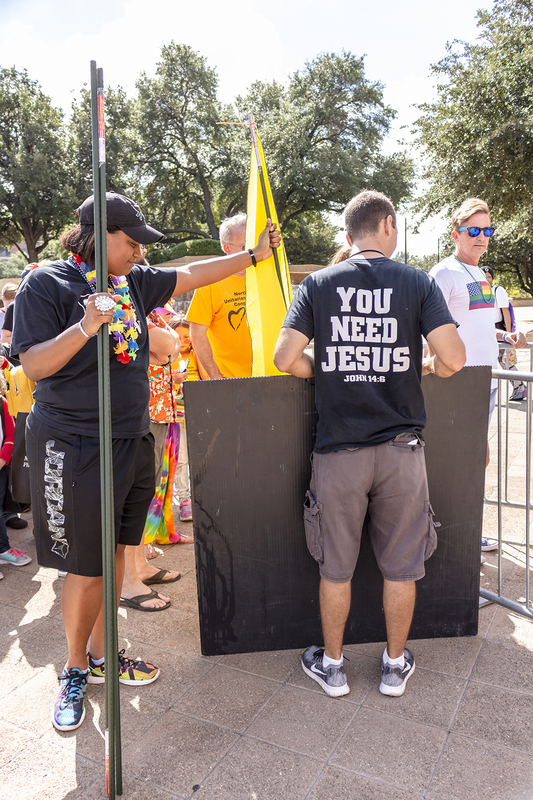 Following the march, parade participants and observers lined up to enter the festival and could not respond or engage with the six protesters calling them sinners, condemning them to hell and ordering them to repent due to the “Do Not Engage Protesters” policy put in place by the Tarrant County Gay Pride Week Association, that organizes the county’s pride events. 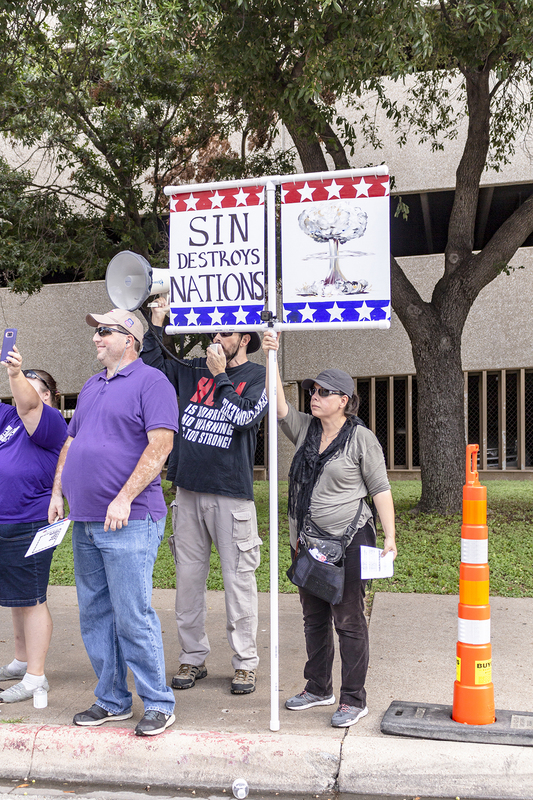 One protester, who identified himself as a street preacher but chose not to give his name, told the crowd that they attended the church of Satan while he attended the Church of Christ. 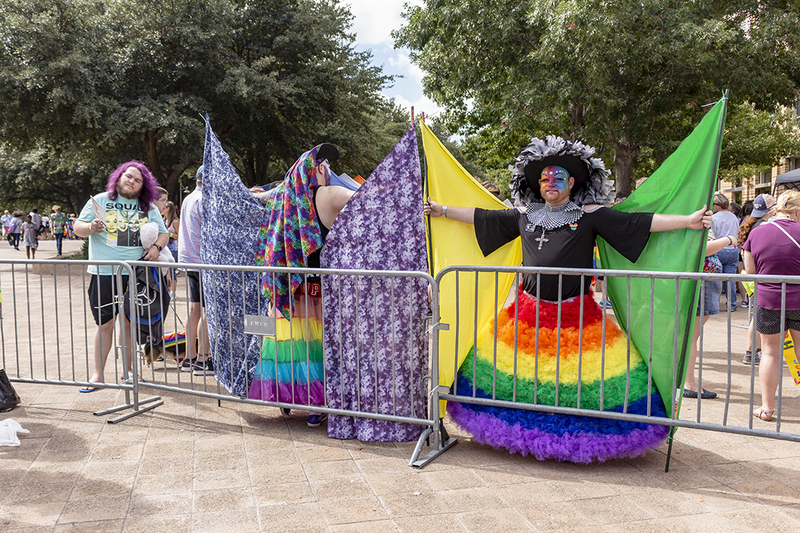 Among the chaos, Ashley Bobb with Dallas-Fort Worth Sisters of Perpetual Indulgence held a yellow flag in front of the protesters’ sign at the entrance and was joined by her fellow sisters on the other side of the fence who held up flags to shield festivalgoers from the protesters. Ahead of the parade, user services adviser Vicki Whorton and SE math associate professor Carol White made sure students knew that if they were approached they were to defuse the unsolicited interaction. Often, the protesters hand things to people, to which Whorton said she advised students to take and then throw in the trash. “If they take it and throw it away, it keeps it off the ground and it keeps it out of the hands of someone else,” she said. But the protesters certainly didn’t rain on the parade or the festival as Whorton was once again reminded why she and many other faculty and staff work to ensure TCC has a presence at both the parade and the festival each year. “We had all kinds of people coming up to us and asking about classes,” Whorton said. A man approached TCC’s booth during the festival and inquired about GED classes, which fall under the Community and Industry Education umbrella, Whorton said. 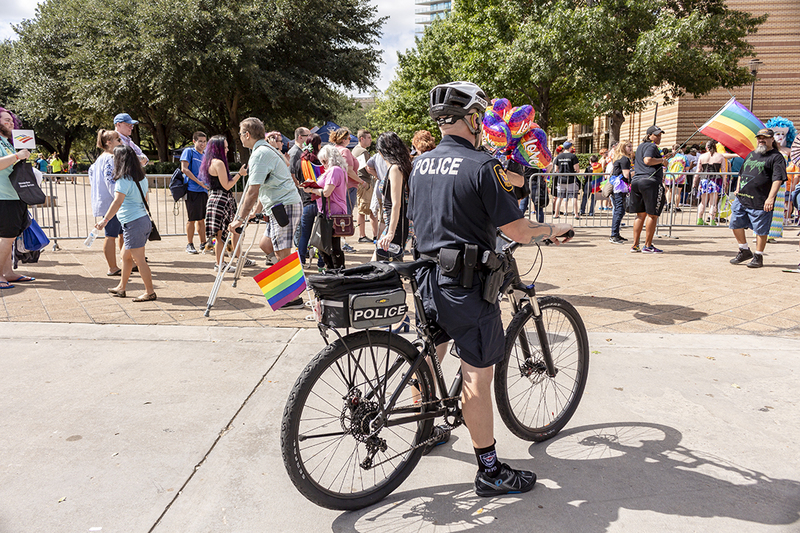 “The need to reach out and empower those in the Tarrant County LGBTQ community is great, and I can tell you our presence at Pride is most definitely valued,” she said.